Sport Collette has been a family affair for the past 40 years. Created in september 1975 by René Collette and his wife, Marie-Claire, the company went through years and evolutions thanks to the commitment of its passionate team. Known at this time as Rive-Sud Sport, the company, dedicated solely on the sale of Arctic cat snowmobiles and Ariens snow blowers, quickly expanded its product offering to include Suzuki and Yamaha motorcycles. Ideally located outside the 132 road in Varennes, the company quickly made a name and created a loyal client base thanks to the choice and quality of its products. In 1978, the company became Sport Varennes Rive-Sud. Since then, it never stopped growing to always provide a high-quality service and a various choice to the customers. The inventory added ATV, motocross, pontoons and other marine products. Through the years, the company established a strong reputation in the area and powersports enthusiasts made it their preferred address to buy the best products. Children and great children of the Collette family and a whole team of professionals join the adventure and contributed to the success of the company. 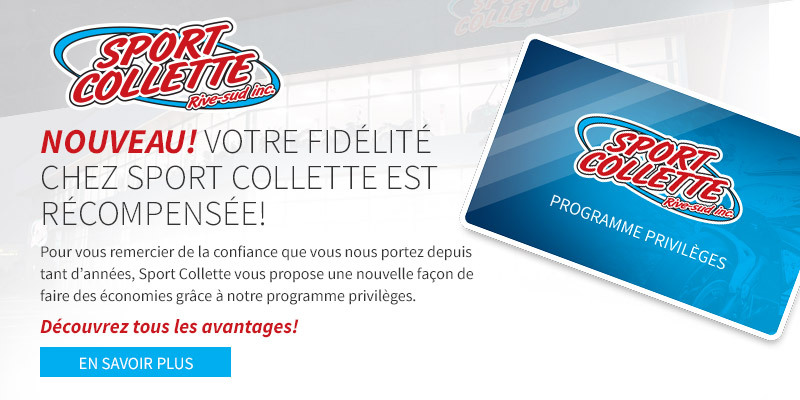 The company, renamed Sport Collette Rive Sud in 2005, is proud to have taken on a new challenge by moving to Armand Frappier boulevard in Sainte Julie, and by creating the biggest complex of its kind on the South Shore of Montreal, beside highway 20. As a business opportunity has arisen, the location was sold. In 2016, Sport Collette Rive Sud moved very close, to the current address, still in Sainte Julie, on the Nobel street, beside highway 20. The company now looks forward to continuing to serve you, offering the personalized service from the beginning combined with the great experience acquired over time. The company has managed to build a relationship of trust with its customers. Those customers made no mistake about it and have stayed loyal to the pioneers of powersports for 40 years. This loyalty is what René Collette, his family and his team are the most proud of.